another paleo girl. 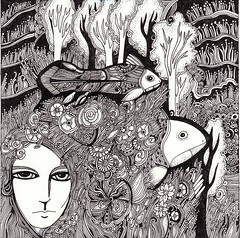 she is 8 x 8 inches, ink on paper. i think i like using the black pitt pens best. though when i went to daniel smith this weekend the supply was quite limited, i will need to seek some out, i think i took their last 2.
i went back to work today. the pain was not too bad but i felt so exhausted and still do. also i felt dizzy and lightheaded. fortunately the studio closed early today due to a media event do i got to come home at 4:15. now i am debating the merits of a nap now versus staying up a bit and just going to bed early. i hope i have more energy tomorrow! today i have been tired and running a slight fever so have taken it easy. i did manage to do my taxes while lying in the couch. tomorrow i will be going back to work. i hope the weather is a bit tamer. here is another one of my drawings, a young paleontologist with trilobites and coelacanths. i suppose a sort of portrait of a paleontologist as a young woman. 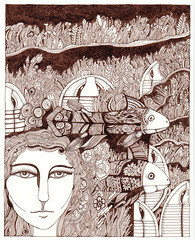 it is 8 x 10 inches, ink on paper. i used walnut-colored pitt pens. well, i think they are officially called sepia. jesse and i helped nusz move stuff today. or, jesse helped and i sat there. i hope if i had tried to help they would have both stopped me. getting better but still quite fatigued and still some pain from incisions. these are coelacanths. they were believed to have been extinct for 65 million years until one was caught off the coast of south africa. 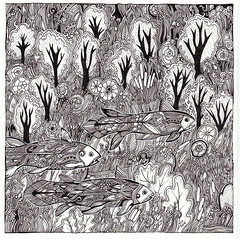 they live in deep waters and are not often seen in shallow waters where people fish. they have bones in their fins, a primitive trait not seem in more modern fish. in their descendents these limbs evolved into limbs which they used to move about on land. this is a drawing i did before i got appendicitis. it is 5 x 5 inches. i just finally scanned it and listed it on Etsy. i have been taking it easy all week. i've just been so exhausted. i went to the doctor today and he said i am healing ok and it just takes time. he said i would be tired for a couple weeks and should not lift anything heavy for another month. so i am just going to take it easy this weekend and try to go back to work tuesday. when i was working on this drawing last week, i was having some abdominal pain, but i did not know what was waiting for me. after a few hours of steady pain on thursday, my pain got more intense, to the point where i decided a trip to the ER was in order. i got there a bit after 11pm. i was admitted between 4 and 5am. i had my appendix out around 9 am, and got to go home about 24 hours after that. fortunately since i went in before it got too bad the risks of complications were reduced. everything went smoothly. i am in quite a bit of pain but it seems to be proceeding about as my last laproscopic surgery did. i thought about waiting to go in but i just knew that things were not right somehow. 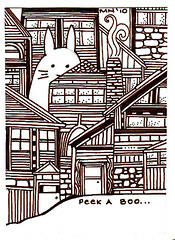 anyhow, before that excitement, i had listed 3 little easter drawings on etsy. meinoel.etsy.com. this is my latest painting! it is 16 x 20", acrylic and ink on canvas. Did you know that dinosaurs laid eggs? Dinosaur eggs have been found at more than 200 sites around the world. Some of the best fossils have been found in the dry deserts of China. i had a very pleasant evening last night drawing. 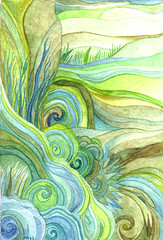 i am looking forward to some drawing and painting time this weekend, though i also need to do my taxes! well, today is the day we honor the nobel traditions of the irish, including the wearing of green, which i have only barely managed myself. (ok, green socks.) apparently where i work during the day wearing green means wearing chartreuse. and you know, that's a hard color to pull off, so i will stick with my black and brown with green socks discretely hidden by black boots. i have never been to ireland and have not more than a drop or two of irish blood, but this painting which reminds me of the northwest, all green and growing, could probably also stand-in for an irish glen. the idea for this painting came to me a few weeks ago when i was taking a shower. sometimes ideas come when one is going something routine that does not require a lot of thought. 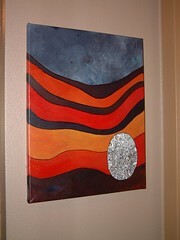 so i got the idea for this painting and it came out fairly similar to what i had envisioned. Plesiosaurs are ancient reptiles, who lived at the same time as the dinosaurs, though they were not actually dinosaurs. there are various things that separate them from dinosaurs, but the main difference is in the pelvis. Plesiosaurs, like dinosaurs, went extinct about 65 million years ago at the end of the Cretaceous. incidentally, many people think the loch ness monster is a plesiosaur that somehow made it to modern times, but since the loch was frozen solid for thousands of years during the last ice age, that seems, sadly, unlikely. it would be exciting, though. wouldn't it? 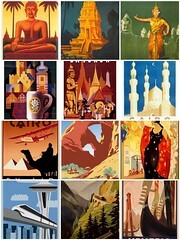 on friday i cataloged 2 vintage travel posters. i've always liked the art you see on these posters, so i pulled together some inspiration for you? where do you want to go first? presuming i can make it through the day i have some a weekend of relaxing and art planned. the last 3 weeks at work have been pretty stressful. i am feeling run-down and in need of solitude. 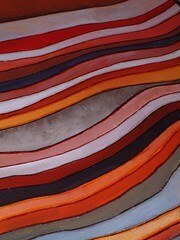 i want to continue to work on my strata series of paintings. i may go to the art supply store this evening and get some paint -- running out of a few colors! and some more 10 x 20" canvases. i already have in mind my next series after the stata series, but i am not sure when i might work on that! i wish there was more time. i have been depressed and not feeling well the last few days. so i have not actually painted since saturday. but today i feel a few faint hints of interest in painting. which will be good when i do get back to it. 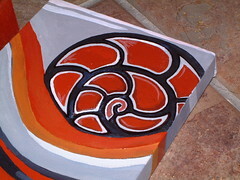 i am right now working on 2 paintings, 1 of a pair of plesiosaurs and one of a prehistoric egg. it will be good to get to work on them when i am feeling ready. 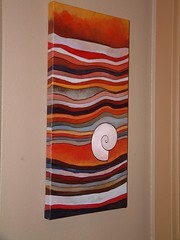 i am liking to 10 x 20" canvases for this series - i think i need to get some more of them. here is another one from the archives. 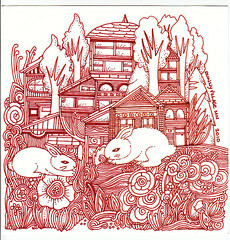 this one is 4 x 4". i had this wonderful ceramic raven pendant. i wish i could tell you who made it, but i do not remember now. if anyone recognizes the artist, please let me know. i got it at the fremont solstice festival years ago, so it is probably a NW artist. i know it is not peruvian, and it has more detail than peruvian ceramics usually do. anyway! i cut the shank off, glued it to a piece of ultrasuede, beaded around it, then glued it to the panel, which i had painted with acrylic. so it's a bit 3- dimensional. 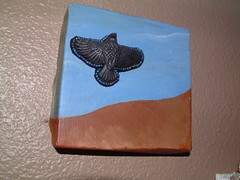 this is a little tiny painting i did i 2004.
i was inspired to share it by some of Theresa Hall's raven art! it looks like a beautiful day, though cold. my allergies have been pretty bad but i still love this time of year and hope to get out and enjoy it a bit! i got the idea for several paintings and several pen and ink drawings while i was in the shower this morning, so it's a pity i have to go to work today! this is a painting i finished last night. layer upon layer and now it's done! Mandy said anything is better 1) in space or 2) with zombies. so i decided to share another painting from the archives. i did this in 2006, though lately people seem interested in it again so i may do some more space monkeys. 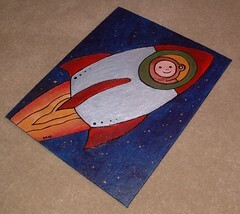 it was of course it was inspired by the russian and american space programs. both countries sent some monkeys into orbit. how cool is it that wikipedia has a whole catagory on monkeys in space. The first ever monkey astronaut was Albert, a rhesus monkey, who on June 11, 1948 rode to over 63 km (39 miles) on a V2 rocket. also, i did not know this until now, the russians also spent mice into space. unfortunately many of these poor creatures never made it back to earth or died soon after their return. honestly i like my bright happy fantasy version of animals in space. where no animals are hurt! i don't think i fancy painting spiders in space but monkeys, mice, and cats are ok.
stressful and tiring day yesterday, but i did manage to work on a painting last night. 2 actually. 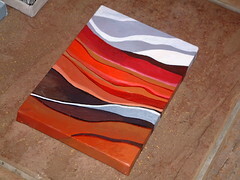 i am working on 2 large ones and hope to get them done this week. i came up with a new idea for the strata series yesterday - in a meeting! - and hope to get going on that this weekend - it requires some wood and a table saw, but fortunately i have manly friends who enjoy the chance to use powertools. 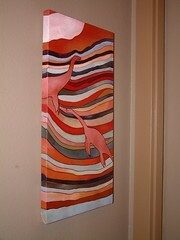 this is a painting i did a few years ago. these are coelacanths -- primitive fish that were thought to have been extinct for 65 million years until people started occasionally catching them. they are lobe-finned fish, with bone supporting their fins, a trait that long long ago led some of their ancestors to develop the ability to support haul themselves out of the ocean and become land creatures. the bone provided support. they have been caught off the coast of madagascar and south africa and a few other places in that region. they live in deep waters, which is why they are seldom caught and were thought to be extinct. 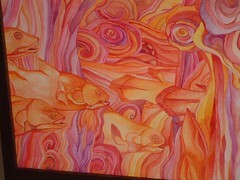 the painting is watercolor, 16 x 20", though this is just a small section of it. here is one from the archives. not to mention some creative license was employed. 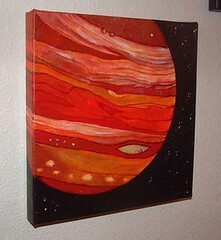 this is my imaginative view of the planet Jupiter. I felt like showing it to y'all again. Possibly promoted by the tv show The Universe which I have recently seem a few episodes of. 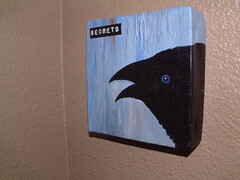 I painted this in 2007 and it is 8 x 8 inches. Acrylic and ink on canvas. I am feeling very tired and sore today. and last night - so I did not paint last night. I hope my energy level goes up a bit soon! when i was 7 years old my family drove from maryland to washington state. we started out a little before christmas, spent christmas in indiana, and new year's in reno. when we got to the painted desert, it rained. and rained. and rained and rained and rained. so i guess my 1st experience with the desert was not typical, but i do recall it quite well. there were lots of rainbows, even double rainbows. i was watching a show on the discovery channel the other day that pointed out that for double rainbows one rainbow is reversed (one will be red, orange, yellow, green, blue, violet, and the other will be violet, blue, green, yellow, orange, red.) that is fascinating and i guess i never noticed that before, being just bowled away in general the few times i have seen a double rainbow. there are so many things i want to paint, draw, and knit. i wish there were more hours in the day! sometimes i think it would be nice not to have to sleep, but actually i love sleeping, so i would be missing out.